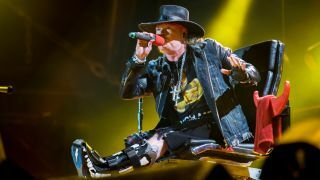 Axl Rose made his live debut with AC/DC on Saturday in Lisbon, Portugal. Stepping in to assist the band following a crisis caused by Brian Johnson’s deteriorating hearing, Rose was on board for the opening date of AC/DC’s European spring tour. The 22-song set at Passeio Maritimo de Algés saw Rose seated at center stage with his left foot in a brace in a much smaller rig than that of the Dave Grohl-loaner throne that he used last month for Guns N’ Roses first reunion shows of 2016, after breaking his foot during his band’s club gig at The Troubadour in Los Angeles on April 1. Opening with the title track to Rock Or Bust, the Lisbon show featured most of the standard setlist from the Australian band while including two official tour debuts from 1978’s Powerage: Rock ‘n’ Roll Damnation – played for the first time since 2003 – and encore add Riff Raff, which was last performed in 1996. Check out Classic Rock’s full review of the Lisbon concert here and see footage of the band’s performances of Rock Or Bust and Shoot To Thrill below. Ahead of his debut, the singer revealed that it was he who reached out to AC/DC as news of Johnson’s departure made international headlines. Rose explained: “I called the day I read about it in the news, that there was a situation going on with Brian’s hearing. I knew there was going to be a problem with having dates on sale and dates sold and stuff like that. AC/DC will continue their spring run this week with a May 10 stop in Seville, Spain and a May 13 show in Marseille, France.